And so ends the six volume history of Corum. Like all the others in the series, this books seesaws between almost successfully concealed laxity of imagination and passages of delightful visual intensity and weirdness. The characters tumble through sometimes hallucinatory and sometimes mundane landscapes and situations, enacting grand patterns that are just unpredictable enough to keep me reading, and just familiar enough to comfort and sometimes bore me. 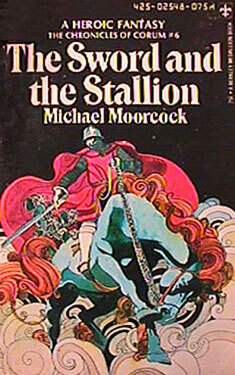 Moorcock is a virtuoso, and these sword and sorcery novels of the 1970s (often written over a matter of days) come across more like brilliant improvisations than orchestrated pieces. As improvisations, they are enjoyable, even brilliant. As finished novels, they are just good enough. As period pieces and artifacts of charm, they are priceless. I have a rule with old sword ans sorcery novels. I can never purchase reprints–only the old covers and yellowed paper will do, and if I am purchasing a series, I prefer to have different, psychedelic or horrifically bad cover art on each book. Without the groovy old covers, the prose inside would be diminished somehow.